If you don’t remember the 1989 arcade game Toki, you are probably not alone. This action/platformer stars Toki, a caveman turned ape and was a niche arcade release that saw ports to home consoles such as the NES and Sega Genesis. A modern remake was announced way back in 2009 and now after all of these years later it has finally released on the Nintendo Switch. The saying goes that “good things come to those who wait”, but in this case the game could have used a few more years in the oven. Toki is light on story and you are able to jump into the game quickly. Taking place in prehistoric times amongst an island chain, Bashtar (the wicked sorcerer) kidnaps your girlfriend Miho and transforms you into an ape. You’ll have to chase after him through a wide variety of levels, ranging from the Caverns of Fire to the Ice Palace, and even into the depths of the Dark Jungle. Toki’s controls and movements are as straightforward as any game in recent memory. To defeat the large variety of enemies, Toki can either jump on most of them or he can spit deadly fireballs in any direction. In addition, there is a fair amount of platforming, which involves jumping over pits and lava, swinging from branches, climbing trees, and swimming in lakes. The villains look terrific, as the art style is one of the highlights of this title. I was pleased with the sheer amount of different attackers in this extremely short game. These range from ghosts, spiders, zombies, dragons, crabs, sharks, turtles and many more. Most of these have creative and effective attack variety and defensive mechanics, and you must pay close attention to them to avoid getting hit. Some stages feature an enormous monster acting as a mini-boss. This is the case in the 2nd stage, Neptune Lake as you must defeat an evil siren guarded by sea life. This brought to mind memories of the giant whale in the middle of Bubble Man’s stage in Mega Man 2. At the end of each level a monumental sized boss, each of which dwarfs Toki’s size, appears to try and put a stop to your progress. Each has a life bar and a set of several attacks that you must carefully avoid. All of the bosses look outstanding and these short boss battles were all enjoyable and fair. 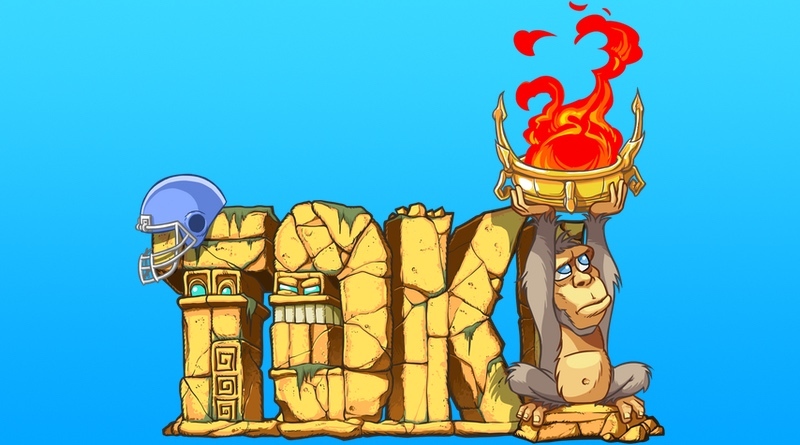 Unlike most platformers, Toki doesn’t feature a whole lot of items to collect. One hit takes away a life, unless you grab the football helmet for armor. There are also 3 upgrades to your fire spit, spanning from a double shot, a spread shot, and a burst of flame. These power-ups are only temporary and after a short duration they vanish. The game seems a little dated and shows its arcade roots as the score is prominently featured. Fruit and a few other items give you points, as does each defeated enemy. A time limit is also imposed and might be an obstacle for those who dillydally through these types of games. There are four difficulty modes and these affect the amount of lives you have and your amount of continues. This game is bright and colorful and I was quite taken by the hand-drawn graphics. The backgrounds look great and the character designs, in particular the huge bosses are top-notch. The orchestrated score is pretty run-of-the-mill, and doesn’t add much or take away from the overall game. This was disappointing as so many platform games have memorable and catchy tunes. As you might expect there are no voice-overs and sound effects are basic. In the end, this game came out much too late. This would have looked outstanding as a later PlayStation title, as 2D platformers were largely absent during that timeframe. This game is a remake, not a sequel, so the levels from the original remain the same, just with modern day graphics and sound. Toki only has seven stages, none of which are overly long. Seven stages are just too few for a game of this type, especially today. Four difficulty levels doesn’t balance or excuse the absence of content. There are also zero extra features or modes in the game and it is only single player. The $29.99 price point is simply asking too much in comparison to what else is out there. That being said, I did have a fun time with this game, as much of it reminded me of a Donkey Kong County title, but it is not a game with lasting appeal or much replay value. Due to its simple controls, it would be a fun introductory game for kids, although maybe throw it on easy for the youngsters. After playing incredibly fast-paced games like Sonic Mania or Freedom Planet, this one might be a great starting point for the younger generation of gamers, although older kids might find it too slow and plodding. If you’re a huge fan of the arcade game you might find more to like here, but overall I left feeling it was an average game that was over far too quickly. I admire the team that finally got this game finished after nine years. Obviously there are Toki fans out there, but after waiting so long I fear most of them will be disappointed, mostly by the game’s length and lack of features. For the classic or casual gamer looking for a great 2D platform/adventure title, there are simply far superior choices at a better value.